Can we solve the NRL fan no-shows at Semi Finals in Sydney? 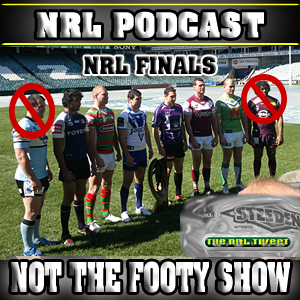 NOT The Footy Show Episode 126 asks why don't NRL fans just go to the Finals even if their team isn't playing? Join hosts Warrick Nicolson and DC Chapman as they preview both Semi Finals: Manly v Cowboys and Souths v Canberra with Maria Tsialis. We also talk about the leaders for the #NRLTweetPlayerofSeptember Award, the NRL Museum at RL Central, the NRL Media Touch Footy Day and predict Over/Unders on the crowds at the SFS and ANZ this weekend. Plus you find out what the 'D' stands for in wdnicolson.com and we have some GT Tips for you punters out there. NOT The Footy Show one hour of footy stuff you simply cannot get anywhere else... and may not want to. NOT The Footy Show will release another Podcast on Sunday night - September 16 with our Semi Finals Review.